This view looks into the old bus station from the direction of Saint Andrew Square. In the background are the multi-storey car park and offices of the Saint James Centre shopping complex. EARLIER: Before this bus station was built, buses and coaches used to depart from stops in the streets that formed Saint Andrew Square. 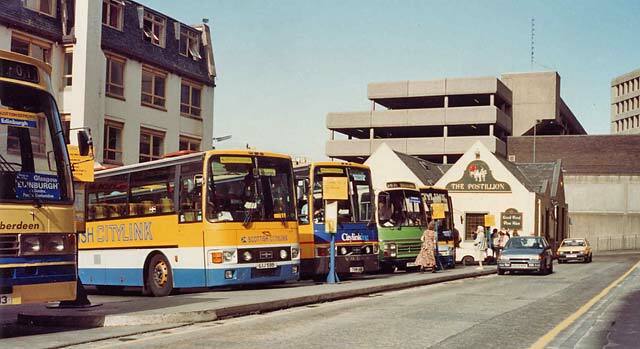 LATER: Buses and coaches depart from a new bus station in Saint Andrew Square, immediately to the north of of the old station. A new Harvey Nichols store was built on the St Andrew Square frontage of the bus station that served as a bus station exit. The store opened in 2002. Thank you to David Scott for providing more information about this photo. "The InterCity coaches pictured here are on what was known as E-stance in the days of the old Bus Station (there being 4 through platforms, A, B, C, & D, with E being an open parking area also used for long-haul & tour departures, separated from A, B, C, D by Elder Street which was a public road running through the Bus Station. The Multrees Walk shops must be on the site of the old ABCD stances, and the new Bus Station must be approx on the old E-Stance and Elder Street. Maps may be needed to verify that." The National Library of Scotland Web Site includes a feature that enables maps from their collection to be viewed with a recent map superimposed on an older one. That can be useful in identifying exactly where old buildings and other features used to be. "The Bus Station was always known as St Andrew Square (usually 'SAS') in the days of Scottish Omnibuses /Eastern Scottish. It was 'Fare Stage 01', so all Scottish Omnibus routes went 'up' from Edinburgh." "Before the days of the Bus Station on the eastern side of St Andrew Square, SMT buses used stances around St Andrew Square, itself. I can't remember when the actual bus station was opened, but it was some time after the war. I think it was in the 1950s. "This Wikipedia web page gives brief details of the two bus stations in St Andrew Square. - The current bus station opened in February 2003. We have recently seen something of a return to the 'old days' of St Andrew Square. - Now that the Edinburgh tram route runs along the east side of St Andrew Square past the sites of the old and new bus stations, traffic restrictions have been imposed and there is less traffic circulating around the square. - Edinburgh tour buses that departed from Waverley Bridge until recently now have new departure stances. While road works are being carried out on Waverley Bridge, these buses are currently departing from stances along the western and northern sides of St Andrew Square. Peter Stubbs: Edinburgh: September 30, 2014. "I've just been looking at this photo with the coaches beside the pub in the bus station - 'The Postillion'. When the St. James Centre was being built, around 1973, I worked on fitting out one of the banks and the Ernest Jones shop. We used to have the odd bar lunch at the pub in the bus station, but then it was 'The Highwayman'. So I assume this photo showing 'The Postillion' was much later. Yes, judging by the name of the pub in the bus station, it looks as if this photo would have been taken after you were fitting out the bank and the pub at St James Centre. Perhaps somebody will be able to study the cars and coaches in this photo and suggest when it might have been taken.